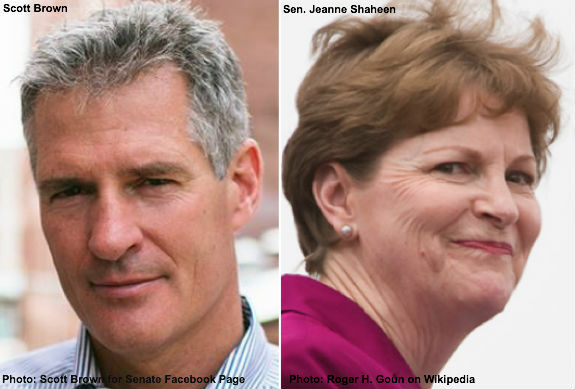 Former Senator Scott Brown, now running against incumbent liberal Democratic Senator Jeanne Shaheen in New Hampshire, was considered the longshot underdog going into the fall campaign. But Brown has made a remarkable post-Labor Day surge following his statewide tour and a media blitz attacking Shaheen on her support for amnesty for illegal aliens. A new Vox Populi polling survey in New Hampshire confirms that Scott Brown has seen a bump in the polls since the Republican primary. Brown, who trailed Shaheen by 12 percent in Vox Populi’s May 19th poll, is now leading her 47 to 43 percent, with 11 percent unsure. This jump reiterates a trend that many surveys have covered over the past couple of weeks. Scott Brown has released at least two TV ads hitting Shaheen for backing amnesty and opposing a border fence. His second effort to capitalize on the public’s fast-growing worry about out-of-control illegal immigration came out the end of August – Labor Day time period. “Want to know why there is lawlessness on our border? Ask Sen. Shaheen. She voted against border security twice, and for amnesty,” Brown says in the ad. “It is time for us to secure the border and enforce the law,” Brown says in the hard hitting ad. Brown has continued pushing the anti-amnesty message telling Breitbart TV on Friday, September 19, "We can't have that green light, saying, send your kid here, don't follow our laws and you'll be rewarded with EBT cards and preferential housing"
Brown added Obama is "circumventing our constitution and the rules and regulations we have dealing with immigration." and he promised if elected he would do, "Anything and everything that is legally able to be done to reverse and stop that policy. That's what I would do." The Vox Populi poll confirms a trend compiled and first reported by The Daily Caller’s Neil Munro. On August 11 Munro reported: “A poll released Thursday by Reuters and Ipsos shows that 82 percent of Americans in New England believe that legal immigration should be reduced or kept level. Only 17 percent believe it should be increased, said the poll.